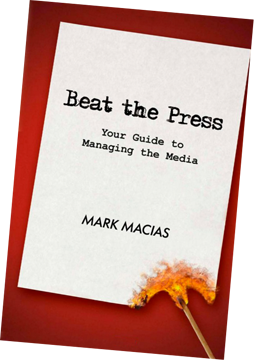 Why is Mark Macias the person to tell you how to Beat the Press? What does he know about the media and crisis communications? His journalism career has taken him places no publicist will ever see. As an Investigative Producer, he has been inside the legal departments of the television networks, NBC and CBS, and the nationally syndicated tabloid programs, American Journal and Inside Edition. He has discussed with corporate counsel why investigative and consumer stories should be killed, aired or altered. Mark has taken on small businesses and public corporations alike in both local and national news outlets. He faced some of the smartest attorneys and dumbest business owners you can imagine. He learned from all of them, and he can help you benefit from their mistakes. 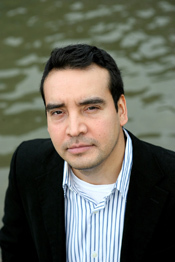 Macias has also worked in news management for what was the most watched and most profitable television station in the United States, WNBC. As the Executive Producer of Special Projects at WNBC, he oversaw and managed the consumer, medical and investigative units. He was responsible for vetting scripts, approving story ideas, overseeing production schedules, managing the franchise reporters and assisting with the station’s overall ratings strategy. Most important, he had to keep legal counsel apprised of any stories that could potentially result in litigation against the parent company, NBC and General Electric. In 2003, Macias left the Number 1 television station in late night news for a cross-town rival, WCBS, the flagship station for CBS. As the Senior Producer of Special Projects at WCBS, his main responsibility was to come up with original story ideas that would increase audience share at 11pm. During his time in that unit, he went after a former US Congressman, national rental car agencies, public corporations, restaurant chains, small business owners and of course our federal, state and municipal governments. Macias has also produced stories for the consumer unit franchise, 3 On Your Side, in Phoenix. It doesn’t matter where you live because nearly every city has at least one television station that focuses on this type of consumer advocacy. The unit might be called, “7 On Your Side,” or “Call to Action,” or “Help me Howard.” The truth is the name of the unit is irrelevant because all of these local consumer departments work the same and likewise, you can approach them all the same. Macias knows how these producers pick their stories, and he will reveal tactics in this book that will help your negative story get lost in the shuffle. He can also reveal internal secrets and buzz words you can say that will help your story seem less news worthy to the researchers and producers. Crisis managers might brag they know how to manage negative stories, but most of them have never worked in a competitive New York newsroom. Fewer of them have ever produced a consumer or investigative story. Only a handful of them have had daily interaction with News Directors and lawyers representing the television networks. Mark has not only been in these situations, but he has thrived with five Emmy nominations. Macias has also never quit learning. He studied investigative reporting at the prestigious journalism think tank, The Poynter Institute (Poynter.org), and he graduated from NICAR, (National Institute of Computer Assisted Reporting) in Columbia, Missouri. This journalist has lived and breathed journalism from every angle.